As a casual military history buff and a previous operator of the USAF’s radar platform, the E-3 AWACS, I have always been keenly appreciative of the unique and powerful role of radar. In my research to learn more about the origins of radar, I realized that the well publicized scenario of British radar superiority at the onset of the Second World War was not entirely true. I have tried to illustrate the historical threads of the invention of radar and the state of German and British radar programs in the early days of World War II. I would like to give thanks to Dr. Richard Muller whose guidance and help has contributed greatly to my understanding and completion of this project. …but the bomber will always get through. 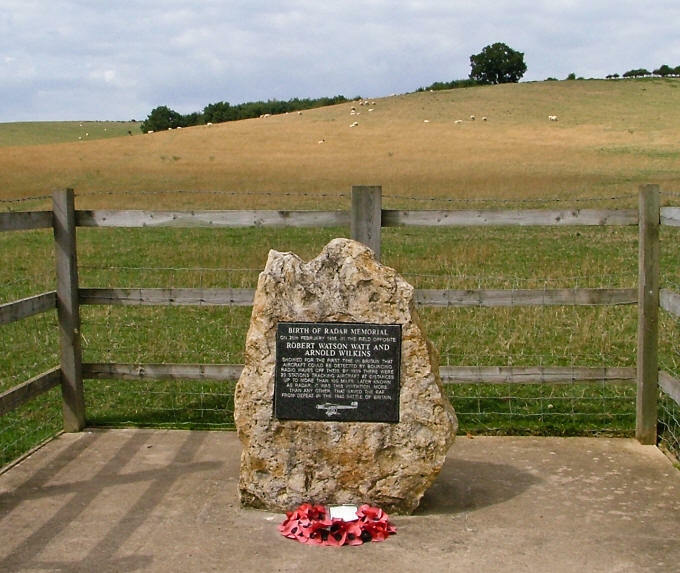 Birth of Radar Memorial at the site of first successful RDR (radio detection and ranging) experiments by Robert Watson-Watt and Arnold Wilkins near Daventry, 26 February 1935. At the time, there was no plaque and no publicity; the first British radar experiments were so secret that only three people witnessed them on the ground. What is not obvious is the fact that this British effort took place two years after the development of a practical radar in Germany . British and Allied memoirs and histories have contributed to the rise of three myths concerning the discovery and employment of radar. These myths are as follows. The first myth is that Sir Robert Watson-Watt is the father and sole inventor of radar. The second is that Germany’s discovery and realization of radar’s military worth occurred after 1940 following exposure to British systems. The third myth gives radar the pivotal role in the defeat of the Luftwaffe in the Battle of Britain. To deflate these myths the origin of radar is traced from James Maxwell’s discovery of radio waves to early radar theorists and inventors. Their role in the story of radar illuminates and contributes to the deflation of the radar myths. Both the rebirth of the Luftwaffe and evolution of the RAF during the 1920’s and 1930’s shows how each service independently arrived at the development of radar technology for different reasons. In 1939 Germany possessed some of the world’s best and most enduring radar designs, as well as essential navigation and bombing aids. England’s Chain Home radar was a dead end technology with serious shortcomings, but was skilfully melded to an innovative command and control system. The illumination of German radar achievements and a balanced analysis of British defensive systems essentially deflates the radar myths. With those words Winston Churchill immortalized the British and Allied scientific war effort against the German enemy, giving credence to several long-held myths about superior and innovative British radar techniques. Post-war histories and autobiographies have concentrated on what the Allied forces did right against the Germans and tend to favourably promote the success of government programs and their administrators. The sheer destruction, defeat, and partition of post-war Germany has made the other side of the story harder to discover and attribute. In the late forties, the world was not in a mood to praise German scientists and technological innovation, with the sole exception being the German rocket scientists. From the wealth of World War II histories and accounts, a theme has evolved and received support over the years concerning British radar at the beginning of the conflict. These themes, essentially myths, concerning radar are the following. The British invented radar and that scientist, Sir Watson-Watt, was the father of this technology. The Germans did not have pre-war radar, and failed to grasp the importance of this technology. The Germans only developed radar in response to their defeat in the skies over Britain, or from stolen British plans and equipment. The British radar system played a unique and pivotal role in the success of the Battle of Britain. In order to deflate these myths to their proper size, this material will be organized into four sections. The first section will explain some basic radio theory and history in warfare. Section two will cover the development of German Luftwaffe defensive strategies and then the existence of German radar. The third section will do the same analysis of the British approach. In section four, the radar myths will be re-examined in light of the previous discussions. The focus of this research is on pre-war Germany and Britain; comparing and contrasting tactics and technology that existed prior to hostilities. The theories and scientific insights into the technology of radar became available to the world in 1887 when Heinrich Hertz in Germany discovered the existence of radio waves. The scientific journey leading to this discovery started with James C. Maxwell’s Dynamical Theory of the Electromagnetic Field developed around the 1850’s which theorized that there existed invisible rays, not seen by the human eye, created by oscillatory electric currents. The search for other types of radiation was a fierce scientific competition leading to discovery of Roentgen’s X-rays and culminated with Hertz’s discovery of the electromagnetic spectrum. Hertz experimented with electric sparks, and in 1888 he found that a spark jumping from two metal spheres in a loop of wire would cause another spark to jump between two other metal spheres in a similar loop, even with this loop being meters away. This simple effect had tremendous implications and gave an alternative to the wire-linked telegraph, the wireless. In less than a decade later Guglielmo Marconi obtained a British patent for his wireless design, and stations were transmitting across the English Channel in 1898. The needs of the British empire for a means of global communications fuelled and accelerated the use of the new wireless technology. This invention was immediately duplicated or rediscovered throughout the world. Notably in 1909 both a German named Karl F. Braun and Marconi shared the Nobel Prize for their work in the area of radio. Rival commercial companies arose from their work, with the Marconi Company in Britain and Telefunken in Germany. They supplied equally capable technology to their countries’ military and exported it to others.